WinSCANOPY can be used in the laboratory, at remote locations on portable computers or in the field on ultra-portable computers which have a Windows operating system. WinSCANOPY comes with color illustrated manuals and a fast and competent technical support. Its list of features makes it an excellent choice for the novice or the expert whether you are interested in canopy structure or radiation analysis. You can find in one single software program features that were found in different programs before. 1) Image acquisition hardware which consists of a camera with calibrated fisheye lens and optional accessories (self-leveling mount, north direction indicator (NorthFinder) and remote controller). 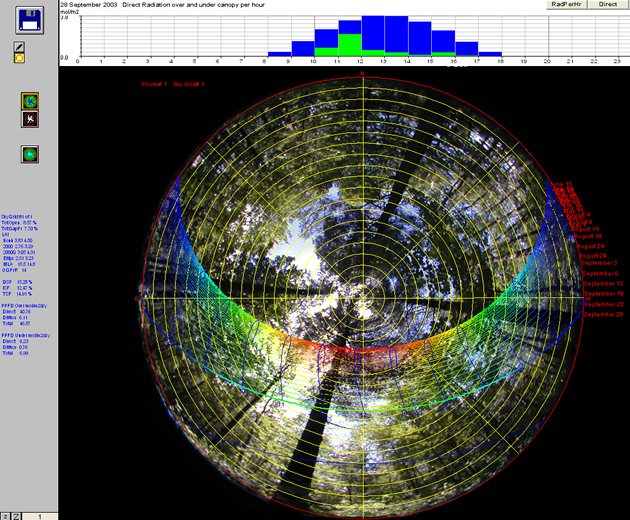 2) Computer software programs which consist of WinSCANOPY (Basic, Reg & Pro DSLR) for hemispherical and cover image analysis and XLScanopy for data visualization.